Stamping Rules! 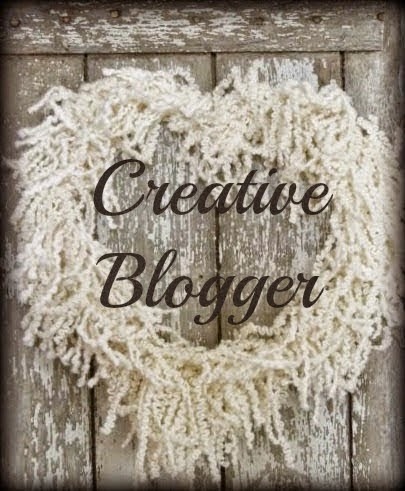 : Creative Blogger Blog Tour! Today I'm double posting after a slow November because the super sweet and talented Dawn Ross nominated me to the Creative Blogger Blog Tour! 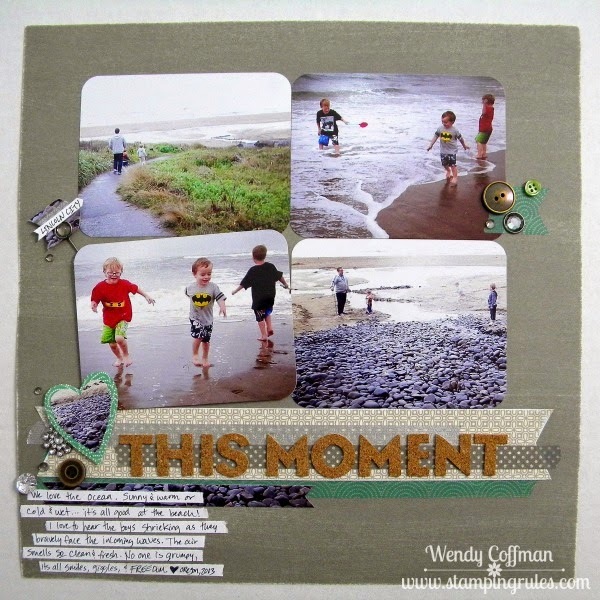 I love Dawn's Blog, I Am A Happy Stamper, because she does a fabulous job with clean and simple stamping, something I'm working hard at trying to understand. I love to see how she makes such fabuous simple cards and projects. Thanks, Dawn! Here is a list of some of the recent Creative Blog Tour alumni. It is SUCH a talented bunch of artists and super duper nice people! A bunch of my artistic heros are on this list, so I am super honored to be nominated. By clicking on the artist's name you will be able to visit their blogs and read more about each artist and their creative process. 1. What are you currently working on? What am I not working on? After moving last spring, most of the house is under control, but my stamp room is a disaster dumping ground for all things undetermined or sparkly. I've got this card for the Atlantic Hearts Sketch Challenge. I love the sketches and am so happy to be included on their DT - if you love sketch challenges, come check them out! 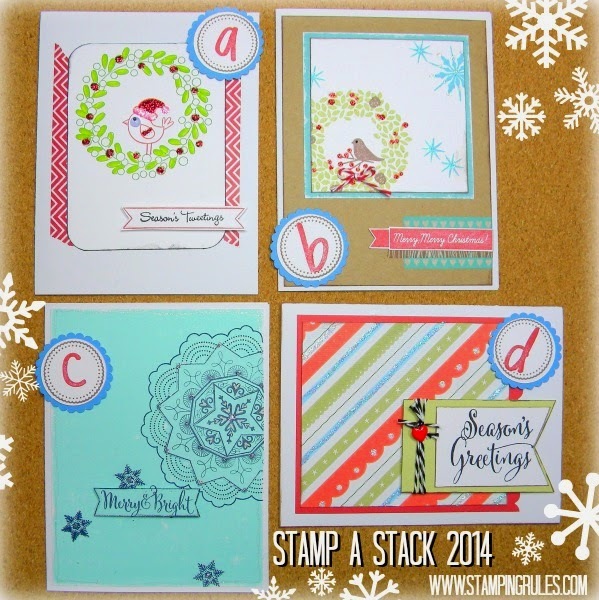 I've also got 4 cards going for my annual Stamp A Stack holiday card makers. 6 pages of Yuletide scrapping sketched and waiting to be finished. A PML mini album workshop to publish. Open House hands on project to cut for my first official Joann's duty this next weekend. The 3-D rose wreath that may never be finished. Craft fair boxes to unpack and reorganize for the next go around. Batman themed invites to Max's birthday party to design and make. A Christmas tree to decorate. Turkey Soup bubbling in the crockpot, with GF biscuits to be made this afternoon. A little boy's tuxedo to clean and more grocery shopping. A box of cards for sale to mail to my favorite bookstore in Portland, Jacobsen's Books. And a partridge in a pear tree. Golly, I think that's a mighty deep question for a gal with no coffee in her system! I guess I like stuff. Bling. Flowers. Glitter. I love the idea of clean and simple...I admire those that can pull it off...but what Imma really gonna do is add some glitter and maybe a few sequins or some distressing...I just craft and pile it on until my heart is happy. Boy howdy, what a great question! I live in a house with an engineer husband and three little boys, ages 8, 6, and 4. It's a three ring circus and I'm the one in the center twirling the flaming baton (if you know where that quote is from, message me and I'll send you a little stamped goodie, soul sista). My home is a shrine to all things Batman and Star Wars. My youngest child goes everywhere dressed as either Robin, Batman, or Bruce Wayne (i.e. his beloved tuxedo). CTMH and papercrafts is my saving grace, my outlet for all things girly and fun that I do not have a good audience for in my daily life. Pinterest pin about making fancy shaped pancakes? Wolfed down with the same speed normal, non-pain-in-the-rear circle GF pancakes are consumed. Set the table with a cloth and nice dishes, maybe some flowers? Expect every inch including the flowers to be coated with gravy/ketchup/syrup. Pants must be purchased in khaki, navy, or denim. No glitter. Only Legos. But in my stamp room, surrounded by glitter paper, shimmer trim, sequins, and 3-D flowers...everything is pretty and fun. The ladies I've had the pleasure of crafting with do not want to discuss the merits of padawan Luke vs. Jedi Luke. Papercrafting is like my raft of sanity and civilization in the lovely but rowdy world of boys that surrounds me everyday. 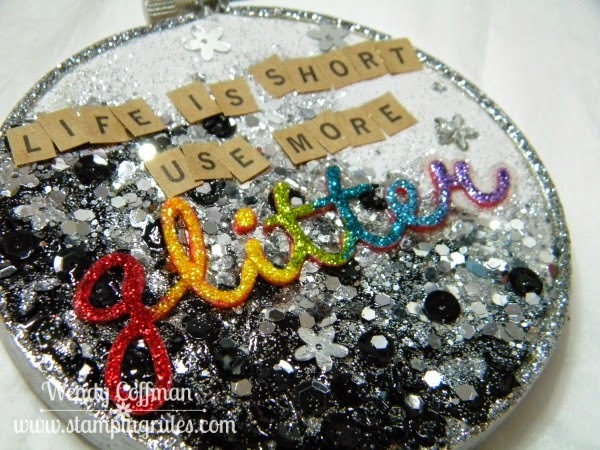 Plus I just really like glitter. Like a whole lot. I wish I had something inspirational to write here...but let's get real. I have a very limited time to spend in my craft space after the demands of my lovely but needy little guys. They are on a strict GF diet and we don't buy much in processed foods which means I'm cooking and baking a good portion of every day to keep up with feeding them. Laundry? Good luck with that. I'm trying to train the kiddos to take it over on threat of going naked, lol. There's rarely time to craft or blog during the day right now. So it goes like this... "Oooh! Atlantic Hearts challenge card is due tomorrow? Awesome - it's only 10 p.m., so I've still got time." Commence staring at sketch blankly until inspiration strikes based on whatever materials are currently on my desk. I should've called my blog Midnight Scrapper, lol. I will occasionally go across the room to retrieve something sparkly. But my big project each month is a 6 page scrapbooking kit, and my cards tend to be made from those papers and whatever embellies are in my bowl of goodness. I have a big clear bowl that catches all scraps of anything cute, sparkly, or awesome. When I make a card that the first place I look...you know, 'casue it's the closest. I have an IKEA Raskog cart next to my seat. The top is my current paper pack materials, the bowl of goodness, a pad of postits, a ruler, plus black and brown Memento Pads. The middle holds a glass jar of washi tape and my CTMH paper samplers and 6x6 pads of papers. The bottom holds my trimmer, any tools I'm too lazy to get up and put away after making something, a small bin of the latest ten or so stamp sets and extra adhesive refills. So basically I sit in my oasis of craftiness and get it done. If I am working on a workshop I clear the table and only have the materials I'm using for the project in front of me so I won't be distracted by other goodies. I try not to look around because I'm completely overwhelmed by the amount of unpacking and sorting still to be done in my catchall space of a room, Instead I just focus on the pretty in front of me and try not to get up to move about the cabin. Glamorous, right? Still, once I make the time to get in there and get my paws inky, I come out a much happier and sweeter person. 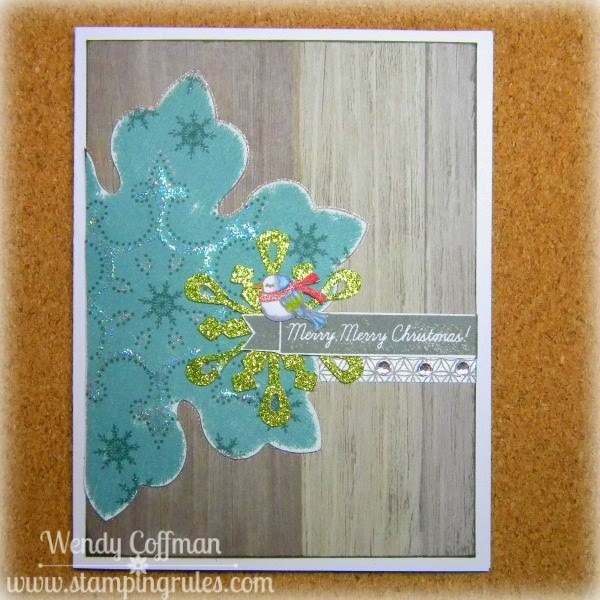 CTMH and stamping is like a mini vacation for my soul! Now I'd like to nominate one of my favorite artists, the fabulous Tina Lovell at My Scrap Happy Life. Tina has 4 boys at home and still finds the time to make some of the cutest cards and pages like ever. She manages it all with a huge smile and I just love her to pieces! Grab a warm cuppa something and go check out her blog today for a treat, then peek into her creative process next Monday. Thanks a bunch for hanging out with me today! Great take on the sketch this week.